Charlie has been teaching people his fundamental lifestyle philosophies full time since 2015. With 1,000+ hours of coaching experience and a range of qualifications from circuits to kettle bells and a kickboxing brown belt, Charlie helps his clients transform their bodies and beliefs in amazing ways. 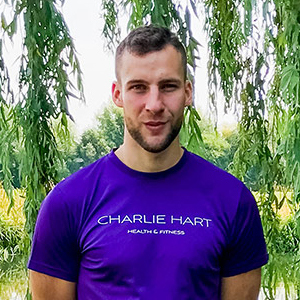 Working with clients of all ages and fitness levels, Charlie combines diet advice with regular training sessions to help people feel better, sleep easier and solve their aches and pains. I want to change the way we treat exercise and diet in the UK. Exercise should be the best part of your day. You should get excited about eating fresh, healthy food that makes you feel fantastic. No one should suffer their whole lives because of a tight back and neck. Let’s fight against the lying media, the nonsense ‘experts’ and weak excuses! Nothing makes me happier than helping people achieve amazing things. My life’s work is now sharing in the success of others as they use fitness and nutrition to improve their lives. How will Charlie train me? When creating personalized programs for my clients, I use a mixture from my experience in the industry and martial arts. When deciding how to train people, I cater to their goals and abilities, whist making it enjoyable. I can cater my exercise to total beginners to regular gym goers. ‘Anti-sedentary’ exercise is my specialty. If you work from a seated position, there’s a good chance you suffer all kinds of annoying aches and pains. I can help! You’ll be amazed at how much better you feel with just a few simple exercises. Combine this with changes in lifestyle (sleep, diet, hydration, etc.) and you will find your daily performance sky rocket. I have 1000+ hours of coaching under my belt now. I have directly trained 100+ people already! Will you be the next to train both your body and mindset with my coaching?